It used to be, if you wanted a website for your business, you needed to either learn how to write code or hire a professional website designer. The process from start to finish could take months and, thousands of dollars later, you still ended up relying on outside help to add content or even make the smallest of changes. Because it was cumbersome and expensive to update content, websites remained stagnant and visitors rarely returned because there was nothing new to see. Thanks to the onset of user-friendly, cloud-based content management systems (CMS), today individuals with little or no web design experience can create an attractive and functional website on their own in a fraction of the time, and continue to add rich content as often as they wish. Ease of use is largely dependent on the software platform you choose though, and there are many, many options for a standalone CMS. 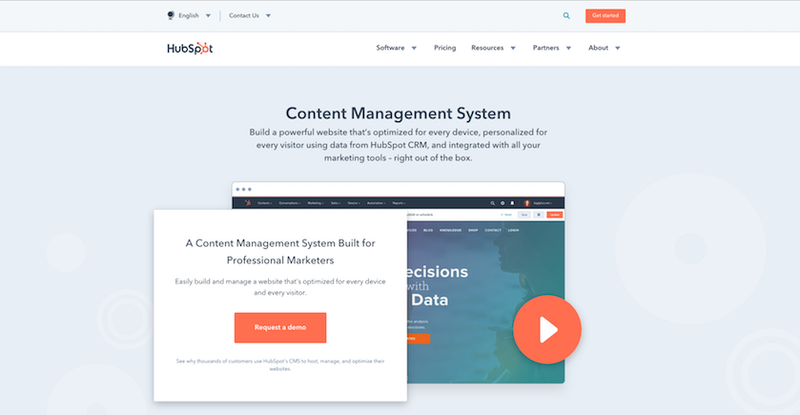 HubSpot — a CMS, CRM, marketing automation, and Sales platform — recently announced its CMS is now available as a standalone product. This is amazing news for marketers and website developers. Here, I’ll help you explore some of the most popular CMS options, their pros and cons, and outline reasons why we feel HubSpot’s standalone CMS is the best choice for small and medium-sized businesses. WordPress was one of the first CMS platforms on the scene, and has been a ubiquitous choice for many. Its brand recognition and reasonable price point make it an appealing choice. However, while it’s been around since 2003, its functionality hasn’t evolved with the times, in my opinion. It’s notoriously difficult to manage and customize, it isn’t inherently intuitive (read: difficult for marketers to manage without coding knowledge), and it’s known to have some quirks and glitches. Of greatest concern to me is its poor security. I’ve built websites using Wordpress and followed best practices to the tee, and they still got hacked. Another inexpensive option, Squarespace makes it easy to get started quickly with its multitude of award-winning website templates. It even allows you to have an online store. Because Squarespace hosts its own websites, they handle website security. You might consider that a pro or a con. Regardless, you don’t have to configure separate security software. While they do have a nice library of templates, they’re not easily customized if you want to tweak them or add your own flare. In addition, having professional photography is a must for this platform. Through the use of artificial intelligence (AI), WIX can make recommendations and help you build your website by answering simple questions about the type of business you run, what styles you like and more. Based on your answers, it will generate a site mockup that will help you envision what a finished design might look like. It’s inexpensive, intuitive, user friendly and easy to edit and update content. Like Squarespace, it has decent security and isn’t very customizable. Sites created with WIX tend to have a similar look to them. So, if you’re looking for a truly unique website, WIX may not be your top choice. Some companies still prefer a highly customized website, and if you work with the right developer and designer, you can build just about anything. That customization typically comes with a hefty price tag, both to initially build the site and then to maintain it going forward. While you can certainly get every possible feature you want, you might not retain control of your content, and the developer may still need to make updates as needed. I have worked with several of these types of systems, and they’re not easy to use unless you’re the developer that originally built it. Additionally, because many developers are not security experts, custom systems are often more vulnerable to cyber attacks. In my opinion, I’ve saved the best for last. HubSpot’s standalone CMS combines the best of both worlds — a platform with the flexibility to create a personalized design and custom features that are still easy for inexperienced users to update. From a design standpoint, it has a great marketplace of templates that are easy to use and can be customized. You can work with a website design agency to create custom modules with easy-to-understand inputs while locking out more important back-end programming so that someone doesn’t accidentally “break” something. As far as price is concerned, they do have a free option, but you’ll likely want to start off with one of their tiered plans, meaning you’ll pay more than some of the out-of-the-box solutions. However, if you want your business to grow (and really, isn’t that the whole point? ), chances are you’ll eventually need more than what those CMS platforms can offer. It makes sense to start out with a CMS that will eliminate the need to go through the painful and time-consuming process of transferring your old website to a more robust platform down the road. It used to be that you had to pay for a HubSpot Professional account to use many of the tools, but the new pricing structure allows companies to get started relatively inexpensively. This lets your company get started with a website on HubSpot and then add on other marketing, sales and service features as your business scales. Depending on the package you choose, HubSpot offers engagement tracking, detailed analytics, landing pages with gated content, conversion forms, chat features, CTAs, A/B testing, email nurturing and a plethora of other inbound marketing functionalities to help you attract, convert, close and delight more customers. It also has a free Customer Relationship Management (CRM) tool built right in — something most website platforms just can’t offer. If you already have separate CRM software to manage your contacts, it can likely be integrated into HubSpot’s platform. Once you’re wildly successful you can go all out and upgrade to HubSpot’s Enterprise tier and pretty much rule the internet. Okay, not quite, but large enterprises can do cool stuff like run custom reports, use predictive lead scoring, create custom event triggers and more. While this pricing tier may cause some sticker shock at first glance, consider if you had to purchase separate software platforms to manage all your marketing, sales and customer service needs — you’d likely end up spending more and then have to deal with trying to integrate and manage them all successfully. HubSpot does it for you. Based on the fact that HubSpot CMS is the first and only combined CMS and CRM that offers the ability to personalize your entire customer experience — from first website visit through every marketing, sales, and service touchpoint — combined with its ease of use and built in security, it is simply the best website builder for SMBs, period. It’s worth the price of entry, especially now that it’s a standalone platform. I wish I could use it for all of my website projects, including yours. If you’re considering a new website or revamping an existing one, reach out to us here at Weidert Group to talk through the possibilities. As a HubSpot Platinum Partner, we know the platform like the back of our hand. Also, check out our free guide on taking a growth-driven design approach to building a website that will help you grow your business.